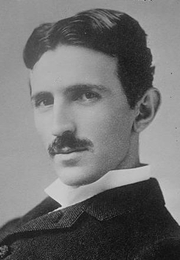 Nikola Tesla, born to Serbian parents in a small village in the Austrian Empire (now Croatia), trained as an electrical engineer and became one of the most important and prolific scientific inventors and innovators of the 19th/20th centuries. He's best known for his groundbreaking contributions to the field of electromagnetism. In 1931, on his 75th birthday, he was on the cover of Time magazine, with the caption, "All the world's his power house," but 12 years later he died impoverished and in debt in New York City. In 1960, the International System of Units designated the term "tesla" for the unit of measurement of magnetic field strength. The year 2006 was celebrated by UNESCO as the 150th anniversary of his birth. Nikola Tesla is currently considered a "single author." If one or more works are by a distinct, homonymous authors, go ahead and split the author. Nikola Tesla is composed of 4 names. You can examine and separate out names.